First post at Compatible Creatures in 17 days, how time seems to fly. Time passes quickly, as in It’s midnight already? Time flies when you’re having fun, or I guess it’s ten years since I last saw you — how time flies. And if a goodly-part of that time is a road trip, clocks and calendar-days are pretty much swift-flying. Near-about this time last year, I had a medical emergency, or maybe a couple of them at the same time, it does happen. After surgery in mid-summer, I’ve had a bunch of follow-up doctor’s appointments, some here on California’s north coast, but probably the most important (though, all are important, I guess), is down at UC Davis in Sacramento, down, way-down in the Central Valley — the latest just last week. The medical engagement also allowed for a decent-sized visit with a daughter completing her PHD at UC Merced, located oddly in Merced, about two hours south of Sacramento. She was on spring break, so we had a good time. During the 1980s I lived in the San Joaquin Valley, first in Visalia, then later in Fresno, so I recognize the physical/mental madness of the region, though now worse. Due to academia, my daughter is resigned to it. However, after living for nearly three decades along the Pacific shoreline, including soon-to-be 12 years here on the North Coast (last place was the Central Coast, San Luis Obispo County), I found the heat and flatness surreal and aggravating. Yet it was just spring! 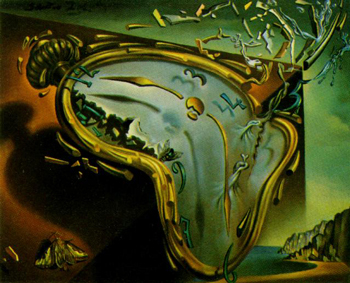 (Illustration: Salvador Dali’s ‘Soft Watch at the Moment of First Explosion,’ found here).